Solidification and melting of metalsand alloys is accompanied by heat release or absorption. Long ago it was found that such transformations occur at a certain temperature, and there exists related phase heat. A thermodynamic investigation into phase equilibrium resulted in understanding that the reconstruction is determined by free energy forces, and the reconstruction itself is based on the principle of local equilibrium. Key words: solidification, melting, phase transition, phase equilibrium, free energy. The work introduces results of the synthesized zirconium addition alloy produced of far-eastern baddeleyite concentrate influence on the parameters of the liquid phase, crystallization processes, structure formation, physical and mechanical properties of cast iron. Cast iron modification during the permanent mold casting efficiently affects the outer chill zone eliminator in the thin-wall castings (12 mm), production of the micro-fine base metal structure and rosette pattern graphite and strength characteristics improvement. Key words: zirconium addition alloy, melt, crystallization, structure formation, physical and mechanical properties, density, density isotherms, chill. Research results of cooling speed influence on structure and properties lead-tin bronze LB2 (C93700) are resulted. It's shown that growth of cooling speed gives increasing of hardness, strength of samples and to decrease a friction. Decrease in cooling speed gives decrease of hardness and strength but at the same time impact strength of samples raises. In article it's shown, how such changes of properties are connected with structure of the cast samples. Key words: antifriction material, friction coefficient, wear resistance, device-engineering properties, plasticity. Antifrictional silumin which excels traditional bronzes in mechanical and tribotechnical properties is developed. Ecologically safe casting technology of billets of 30…300 mm in diameter from antifrictional silumin is created. Their cost is 2-3 times lower than that of similar bronzes. The new technology is introduced in manufacture in the Republic of Belarus. Key words: antifriction alloy, bronze, silumin, wear resistance, dry friction, friction under lubrication conditions. Modern foundries having positive experience with Seiatsu molding lines expand the production and opt for HWS-Sinto again. Key words: foundry modernization in Turkey, Seiatsu-process, quality castings. A comparative study of parts and specimens of high-strength cast aluminum alloy АЛ4МС made in sand molds and by lost foam casting process was conducted. It was shown that it is possible to make castings using polystyrene foam patterns. Change in the structure and properties of АЛ4МС alloy when cast in sand molds and in lost foam casting process is discussed. Key words: aluminum alloys, lost foam casting, polystyrene foam. 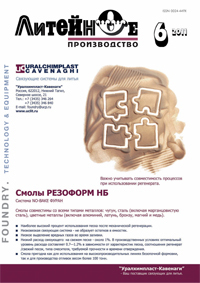 A comparative analysis of technologies of making small-size castings in expendable molds was performed. Evaluation criteria included mold properties, casting quality, their prime cost, and impact of the technology on the environment. Key words: mold, strength, gas permeability, gas evolution, prime cost. During deposition of binder on the grains of sand there are no restrictions on the possible distribution of small amounts of binder on the grains of sand. The article discusses the properties of the mixture obtained by depositing a binder in a fluidized bed and mechanical agitation. Keywords: deposition, fluidized bed, homogeneity of distribution. A conclusion has been made on the prospects of using clay reduction to nanodimensions for improving mold quality. Keywords: coal clay, screen size, nano-size, refractory, grinding. The results of researches features of application peaty thermal insulating compounds on phosphate - metal binders. Key words: technology, thermal insulating of risers, peat, phosphate - metal binders. Effect of polystyrene solution on core sand properties, and possibility of its combination with sodium silicate is discussed. Effect of concentration, quantity of polymer binder at different temperatures on strength, flowability, burningon, knockout capability and reclaimability of sodium silicate bonded sand was investigated. It was found that concentration and quantity of polystyrene are the most important factors. Key words: polystyrene solution, core compositions, sodium silicate, molding and core sand, use of waste, weakening additive.